You just have to smile a little. Above is an advertisement we are running in major Cebu City newspapers soon. A bit tongue-in-cheek, a bit of irreverent fun. ZUBUCHON is celebrating its sixth month of operations, and to mark this milestone, we are introducing ZUBUCHON LIGHT! A smaller, cuter, leaner and less fattening take on its chunkier, jolly cousin, ZUBUCHON. For the month of June, the introductory price for this roasted piglet is just PHP2,888, probably one of the LOWEST PRICES amongst similar sized lechons in Cebu. The offer allows folks who have been hesitant to order our larger lechons to taste our Zubuchon practically at cost, if not below cost. We only use the finest ingredients, including fresh and dried aromatics, herbs and spices (organic wherever possible), sea salt and olive oil. Absolutely no added MSG. And each lechon is accupunctured, and hand-turned on a bamboo pole by a lechonero, not a mechanized rotisserie. It is an excellent value at PHP2,888.00! And our way of saying a HUGE THANK YOU to the many folks in Cebu, and those who have visited Cebu, who have tried our products over the past six months. Daghang salamat sa inyong tanan! Most consumers in Cebu seem to buy lechons with a PHP3,200 or less price tag. I am not sure if that preference is truly because they intentionally desire a very small piglet (with less fat and meat as well), or simply because the economics of the times dictates a lower price point, period. However, the “frugal” amongst you should really check out this analysis — if you order a typical commercial lechon in Cebu for say PHP3,000, it is roughly 4-5 kilos in total cooked weight, then if you remove the head, feet and stuffing, the likely amount of net edible meat/bones is roughly 3-3.5 kilos or a whopping PHP850-1,000 per kilo of lechon meat/bones. THAT is PRICEY. Zubuchon’s most recommended size of whole lechon at PHP5,500 is roughly 16-18 kilos lechon cooked weight, or say 13-14 kilos net of head and feet, and that works out to roughly PHP400 per kilo. We believe this larger size also has the best balance of some fat for added flavor and beautiful basting, along with a reasonable amount of meat for consumption. So remember, a cheaper overall price does NOT necessarily mean you get a better value. Finally, some thoughts on that INFURIATING INDUSTRY PRACTICE of blithely stating a particular lechon is “good for 30 persons” or some other vague assertion. It’s very easy to see just how reasonable purveyors are being. The average healthy serving for a guest at a buffet with other food on offer is probably between 150 -200 grams cooked weight of lechon meat and skin, though some can eat far more. So if we use an easy benchmark of say 5 servings per kilo of lechon meat/bones, then a lechon with a net weight (no head, feet or stuffing) of say 13 kilos should, in theory serve 65 people. However, from my experience, with lechon enthusiasts amongst one’s guest list, it might be safer to assume say 250-300 grams per person. When you purchase lechons, ALWAYS ask for the estimated cooked weight (and make sure you WEIGH it when it arrives), then remove 2+ kilos for the head and feet for a larger lechon, then divide that number by your portion size. Don’t believe what anyone asserts is “good for 30 persons”..
from those photos, i can already tell that the skin is ultra crispy!! happy anniversary to the little red pig!! i get it: the price is light and right!! This is definitely going to be a winner amongst the Cebuano’s who have regular Sunday family lunch gatherings. I’m assuming the net weight (minus head and feet) for the Zubuchon Light is about 4 kilos (am I correct?) and that should feed about 20 people, which is the typical Sunday family size gathering. Then the head and feet can still be made to paksiw and sinigang….LAMI-A!!!! Artisan, I think net weight is about 3.0-3.5 kilos if I am not mistaken. So for these, for family and friends, I would think 12-15 guests is a better guide. That gives everyone more skin as well. Also, the six months is just since Zubuchon went official… of course the crew had already had a few months trial by fire at the Sunday market! :) This was the lechon size we have been testing recently to make sure it passed muster and was good to introduce to the public. Still a good size considering some of the family guest are kids. Hmmmm, will have to check what the family is planning this weekend….hehehehe. Gimingaw uruy ko ug inasal….that used to be the centerpiece of our family Sunday lunches :( Congrats on the success of your porky masterpiece MM and crew! Good idea MM and crew! Whenever i’m in Cebu, my dad would buy 4 kilos of lechon for sunday lunch. Zubochon light is perfect for sunday lunch centerpiece. Congrats on the success of Zubuchon. Cannot wait till I get back to Manila on June 19 to order one again. Normally younger animals attract a significant premium over older varieties of meat, so this is a fantastic offer. Many would be willing to pay much more for a young lechon. I’m dedicating my birthday to you because today I am going to try the crispy belly flavours that you posted and i’ve been waiting for this day to come….. Yummmm, Yummmm, Yummmm!!!! wow..parang Coke light…lets fly to cebu as there are several cheap flights offerred by pal, cebu pacific and air phil. congrats to you and your crew! Bubut, exactly. I just booked a roundtrip airfare to Cebu under PAL’s promo the other day for just PHP 1240 roundtrip! For that price, you could almost go to Cebu for a lechon lunch. :) chloe, HAPPY, HAPPY BIRTHDAY! I hope the liempo comes out well! Thanks all for such encouraging and kind remarks! 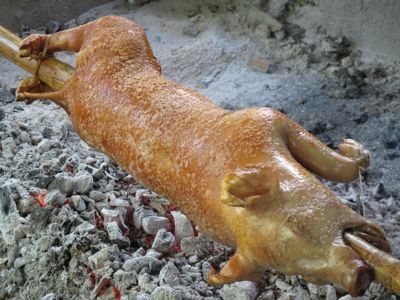 what is the usual weight, before cooking, for a lechon weighing 5 kilos with head and legs on? i’ve always been curious as to how much shrinkage happens during the loooooong cooking process. the ad is made of win! Here in Manila, the cost of “native” piglets is P360 to 380 per kilo dressed weight (approximately 5 kg. ), while the hybrid piglets cost only P250 or so per kg. Problem is that hybrids don’t make good cochinillos. Just wondering why Cebu’s lechons seem so much cheaper? Zubuchon light with a bottle of coke zero is a dieter’s dream =) I tried your sisig with hoisin and cucumber in cua pao bun. It was great! I have a slight aversion to eating small chopped up bits of unrecognizable protein so when eating sisig in restaurants I always wonder what’s in it. But with yours I’m sure only good things went in it. And you can taste the lechon’s caramelized skin and the herbs. good stuff! Thanks so much again. How many does one lechon feed? Any plans for the manila branch? How about a lechon eb here in manila? How many does a lechon feed? 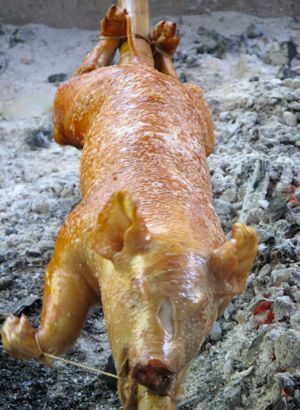 I remember a journalist called “Del Fierro” who was able to finish one lechon de leche by himself at one sitting. Happy 6th monthsery to Zubuchon.Congratulations! Sana you have a Manila branch! congratulations! one of those reasons i wish i am home in cebu right at this time. so envious of my ka-bisdak. ended up having zubuchon for lunch because of this post (eating kinamot style of course). :DDD thanks for the breakdown MM. First off, let me thank you for visiting and leaving a comment on my blog – http://www.Mindanaoan.com ! That really gave me quite a thrill :D Secondly, happy anniversary to Zubuchon! Can’t wait to try the “light” version! Dude you’re making me wish I could fly to Cebu as soon as I saw the pix, then even had a chance reading the whole article. Droooooooooolllllll naka-ka TL. One thing I notice though, Why is it that each time you do an article on “Lechon”, folks like me comes out of the woods and just can’t help ourselves and comment? Perhaps it’s that magical animal. i was just thinking MM, it would be funny if you put a balloon (stylized like your little pig) at the end of its tail — that would be Zubuchon Light !! MM, can’t wait to be in Manila this year! I already have Zubuchon on my MUST TRY list. MM, why don’t you just bring one of your lechoneros in Manila and cook the lechon there so that more people will taste it fresh from the lechonan. no stall in manila? I’d love to sample that pig one of these days, even in the Makati Sunday markets. Where can I buy those frozen cuts for sisig? Also in Cebu? I hope not. 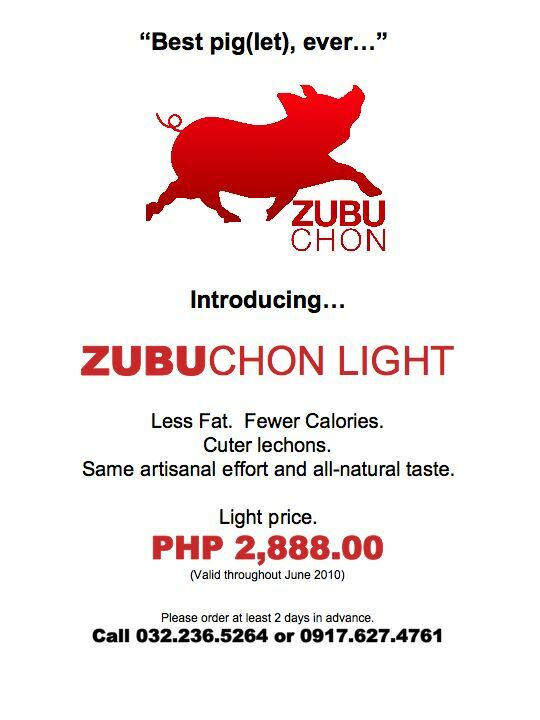 Would you still advise to purchase zubuchon light and have it handcarried from cebu back to manila? I wanted to surprise my mom for her birthday and I would have wanted to buy a whole one rather than the boxed chopped set. Is it true that the quality suffers as you bring it back to Manila due to the travel time? Thanks. akcebu, I think the regular price is PHP3,200, but please contact Zubuchon at the numbers above for certainty… thanks. Hi! How many days does it take for the airfreight? I will be going to Bohol before flying back to Manila. Can it be flown or ferried to Panglao,Bohol?